*Important Disclaimer: Any donations to this crowdfunding project will not be tax-deductible! that I host on the internet! I operate a number of web pages that are related to my ministry work but for various reasons they do not fit into a “tax deductible” category with the IRS. So I pay for them personally and operate them on my personal web hosting account, rather than host them with the ministry account. For example, I host Ben Gilmore’s ACH Study Groups website for free! (www.achstudygroups.com). For about a year now I have been having major hassles with my formerly-great hosting provider known as Bluehost. I wish to move to a new hosting provider. I can host all of my sites for the next 3 years for $186.00! That will save a bunch of Kingdom Money monthly (about $12/mo – more than $250 over the entire 3 years!) and get me out of the icky Bluehost situation. Can you imagine a world without ME on the internet? So… Save the Internet! 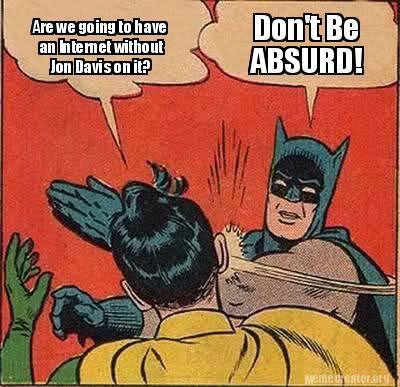 Keep Jon Davis and his sites going strong for the next 3 years! There is a soul out there for whom the whole amount isn’t much. There are 7 souls out there who could kick in $30.00 each (I added a bit on to cover papal fees). Will you help me keep my good content on the internet? Let’s try and do this in the next couple of days so I don’t miss the sale!